East Coast steak, chop and seafood house comes to Orange County. 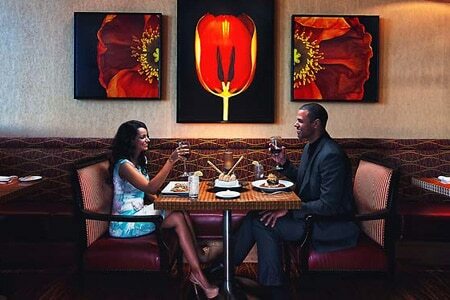 : Sam & Harry’s is a classic East Coast steak and seafood restaurant based in Washington, D.C. The group’s only West Coast outpost sits inside the Newport Beach Marriott Hotel & Spa, across from Fashion Island. The vibe is classy yet California casual, complete with an ocean view, an outdoor dining area with cozy fire pits, loads of private rooms and a distinctively modern lounge next door. At lunch, try a burger, club sandwich, BLT, French onion soup or steak salad. If you enjoy crab cakes, don’t miss out on these meaty wonders, which come with a tangy lemon tartar sauce and an herb dipping sauce. The menu also features tender Prime steaks, a rack of lamb and beef tenderloin medallions. Everything is ordered à la carte, so don’t forget to partake in a few side dishes, like steamed asparagus or white truffle macaroni and cheese. Seafood is flown in daily and cooked in a light butter sauce to enhance the delicate flavors. Wine director Steven Ackad has assembled an impressive collection of bottles from around the world, with a focus on producers in France and California. The aforementioned lounge serves items from the restaurant’s regular menu, along with sushi by chef Kiyo, starting at 5 p.m. Tuesday through Saturday.